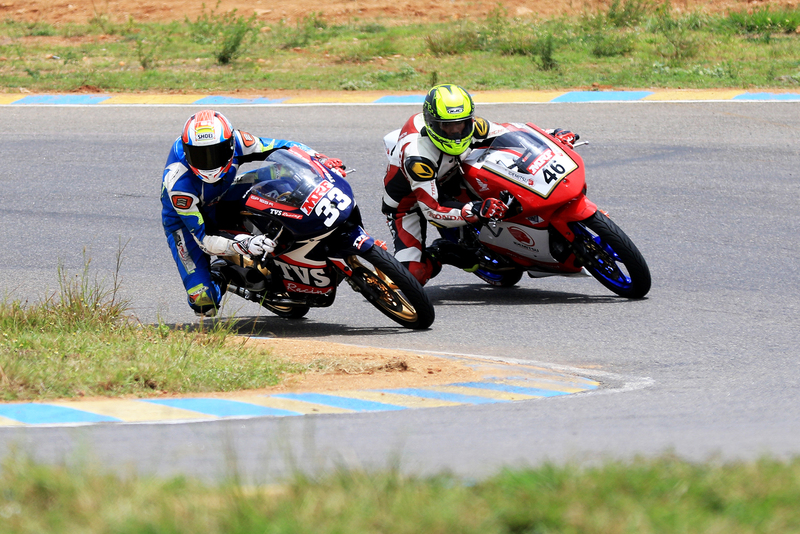 Chennai, September 2: Jagan Kumar (TVS Racing) and Prabhu Arunagiri (Team Alisha Abdullah) notched a double apiece in their respective categories in the third round of the MRF MMSC fmsci Indian National Motorcycle Racing Championship at the MMRT, here on Sunday. Also on the winner’s list in the National Championship were Kevin Kannan (Rockers Racing) who scored his maiden victory in the Pro-Stock 165cc class and Arjun Rajendran who took the honours in the Novice (Stock 165cc) category. Last year’s champion Jagan, without a win in the first two rounds this season, closed out a very successful weekend with another dominating performance in the premier Super Sport Indian (165cc) class, but not without a bitter fight with his arch-rival Sarath Kumar (Idemitsu Honda Ten10 Racing) who denied TVS Racing a repeat of yesterday’s 1-2 finish by pipping KY Ahamed to second place in a thrilling race. Pole-sitter Sarath Kumar conceded his track position soon after start with Jagan and later Ahamed moving past him. 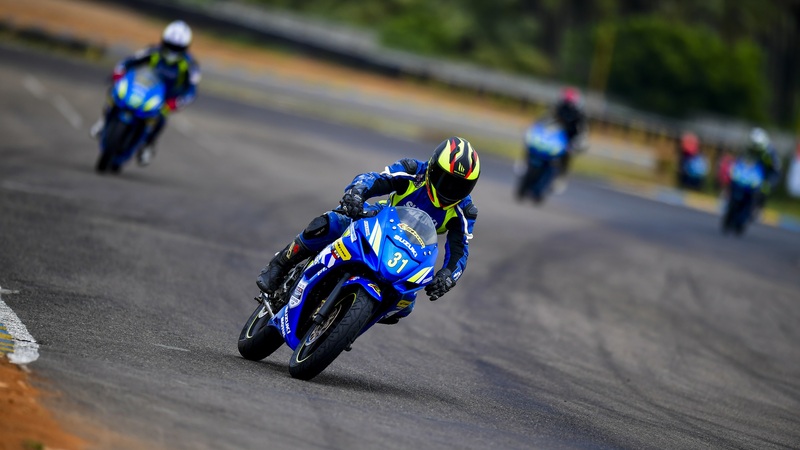 However, Sarath fought his way back to overtake Ahamed and then hung on grimly for a well-deserved second spot while Jagan put in consistent laps to emerge a clear winner. 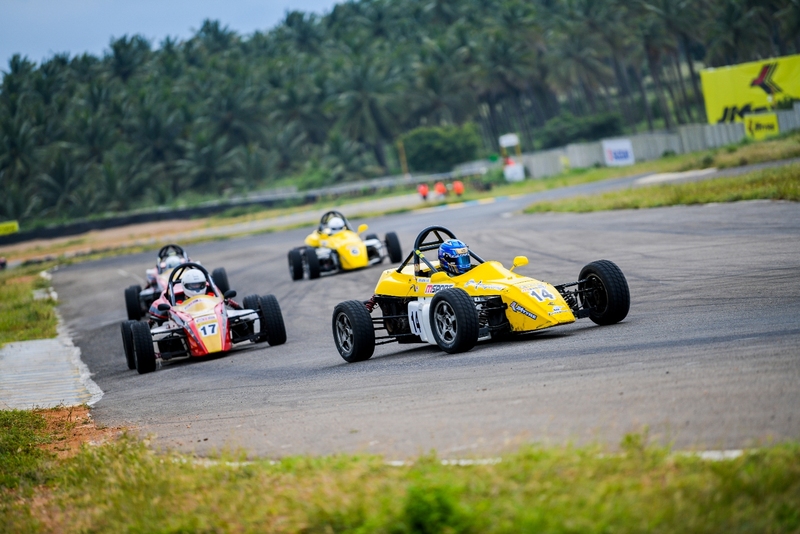 Coimbatore, September 1: Mumbai’s Nayan Chatterjee and the Chennai duo of Vishnu Prasad and Joseph Mathew underlined their class in Round 2 of the JK Tyre FMSCI National Racing Championship here on Saturday, winning their respective races in great style on the opening day here at the Kari Motor Speedway. Nayan Chatterjee was at his fastest best in the Euro JK 2018 category, making his intentions clear in the morning qualifiers itself. In an incredibly pacy session that saw the entire field finish virtually inside a few breaths of each other, he clocked the fastest lap time of 1:00.514 minutes. 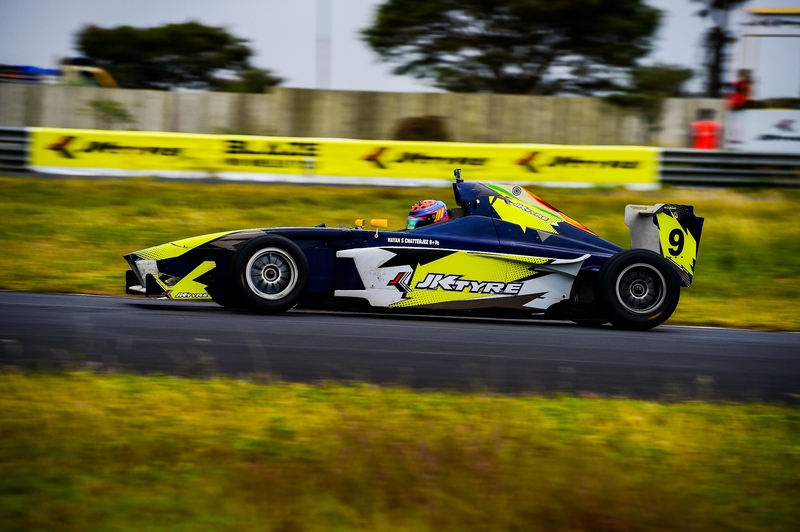 Nayan continued his great run through the day, winning both his races quite comfortably. He collected 16 crucial points to stake his claim for this year’s crown. Karthik Tharani claimed the second place in both the races while Sri Lanka’s Brayan Perera and Ashwin Datta shared the third place to leave the competition tantalisingly poised. 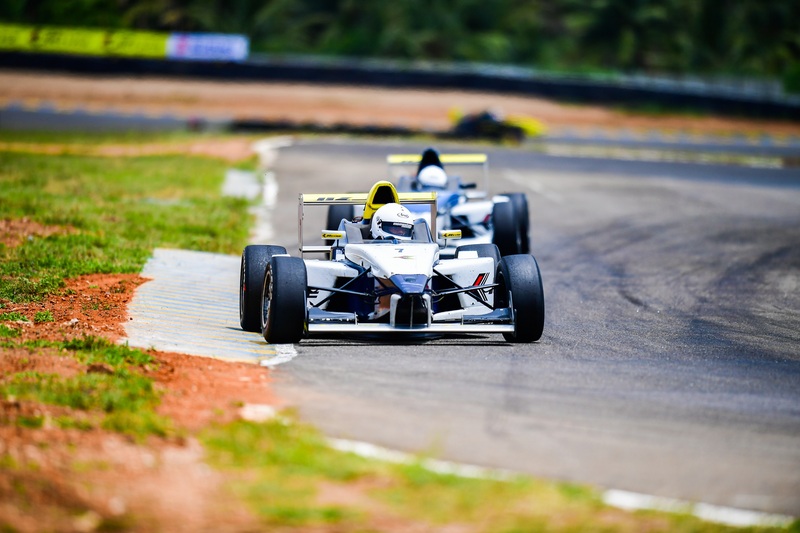 Chennai, Sept 1: Frenchman Alessandro Ghiretti put in a blistering lap of one minute, 37.736 seconds which earned him the pole position in the Formula 4 South-East Asia Championship at the MMRT, here on Saturday. In the process, Ghiretti pushed championship leader Thailand’s Kane Shepherd (01:38.069) to second spot while Malaysian Muizz Musyaffa (01:38.715) was third quickest in today’s qualifying session. On Sunday, three races are scheduled in this category. Peter Reynolds from the United Kingdom expectedly took pole position in the Caterham (Asia) Championship while India’s guest driver, Vicky Chandhok, will start second on the grid for tomorrow’s race, ahead of Sri Lankan Shirendra Lawrence. Reynolds, who enjoys a 27-point lead over Lawrence in the championship following two wins in eight starts, clocked a best lap of 01minute, 53.538 seconds in the qualifying session while Chandhok did a flying lap of 01:55.690 after struggling for pace in the final practice session earlier in the day. Lawrence did a 01:56.118 and will have his task cut out on the morrow. Formula 4 South-East Asia Championship: 1. Alessandro Ghiretti (France) (01min, 37.736secs); 2. Kane Shepherd (Thailand) (01:38:069); 3. Muizz Musyaffa (Malaysia) (01:38.715). Caterham (Asia): 1, Peter Reynolds (UK) (01:53.538); 2. Vicky Chandhok (India) (01:55.690); 3. Shirendra Lawrence (Sri Lanka) (01:56.118). Chennai, September 1: Defending champion Jagan Kumar finally got his campaign on track as he notched his first win of the season in five starts while leading a 1-2 finish for TVS Racing along with KY Ahamed in the premier Super Sport Indian 165cc class of the MRF MMSC fmsci Indian National Motorcycle Racing Championship at the MMRT, here on Saturday. While TVS Racing team celebrated, arch-rivals Idemitsu Honda Ten10 Racing had to be content with a third-place finish through Mathana Kumar as pole-sitter Sarath Kumar retired barely 50 metres after the start with a broken gear lever and championship leader Rajiv Sethu crashed in the back sweep in the very first lap. However, there was some cheer for the Honda camp as Mithun Kumar scored a his first of the current season in the Pro-Stock 165cc class with RACR’s Naresh Babu and Sivanesan of TVS Racing following him over the finish line. Earlier, pole-sitter Prabhu Arunagiri (Team Alisha Abdullah) fought his way to a close win over Gusto Racing’s Amarnath Menon and Satyanarayana Raju in the Pro-Stock 301-400cc class with less than one second separating the trio while Chennai’s Shruthi Nagarajan (Apex Racing Academy) recorded her first-ever win in the Girls (Stock 165cc) category. 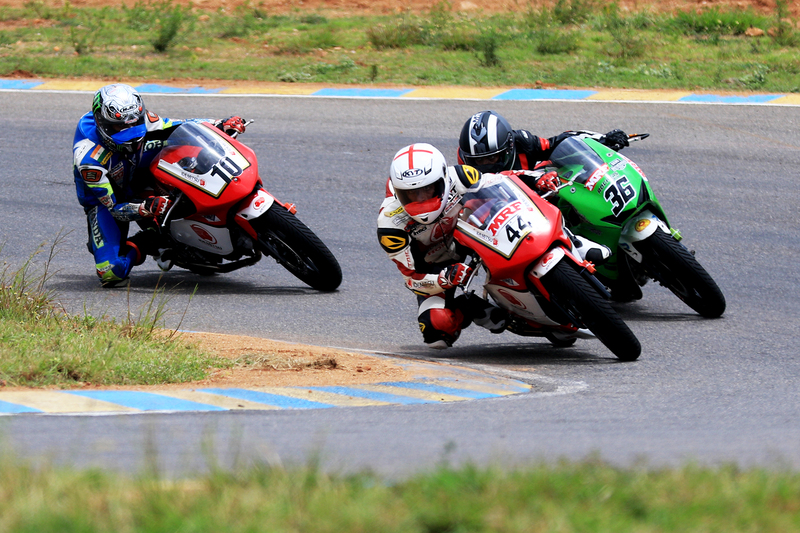 Coimbatore, August 31: The Chennai trio of Ashwin Datta, Vishnu Prasad and Joseph Matthew will aim to consolidate their positions at the top of the leaderboard as the curtain goes up on Round 2 of the 21st JK Tyre FMSCI National Racing Championship here on Saturday. 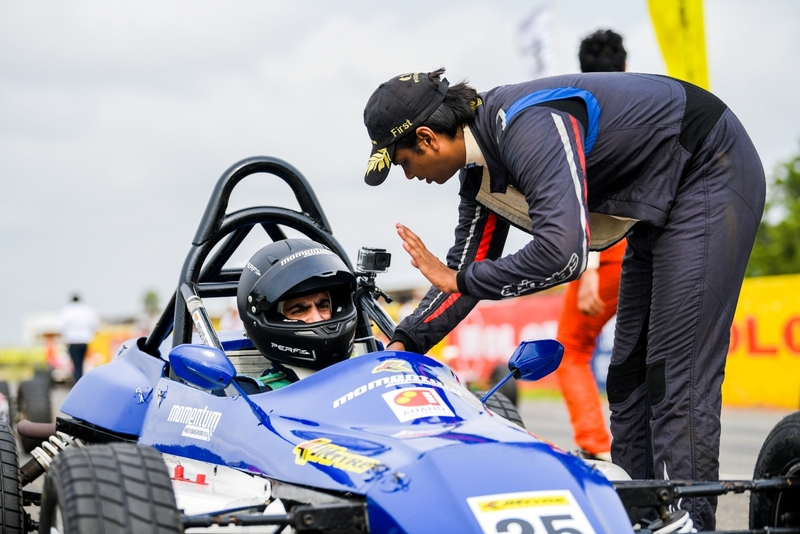 Ashwin Datta, who surprised the field by nosing ahead in Round 1 of the blue riband Euro JK 18 event despite not winning a single race, will hope to rectify that. He was very consistent though, managing three podium finishes to garner 24 points. Sri Lanka’s Brayan Perera and Karthik Tharani, however, are just one point adrift (at 23 points) and will hope to dismantle Ashwin from the top. They won two races each but also finished fifth and sixth in the other two to slide down the table. Mumbai's Nayan Chatterjee will also be pushing hard to prove his class. He suffered an early setback as his car forced him to pull out in the season’s first race. He made up in the last three races to add 20 points into his kitty and he will be eager to fire in this round. “It was a great opening round and it did throw some surprises. I am sure the teams and drivers are raring to go and we look forward to another exhilarating round of racing,” Sanjay Sharma, head of JK Tyre Motorsports, said.